A shocked crowd of holiday-makers at a beach near Russia’s western city of Kaliningrad had to make way for a landing craft carrier which unexpectedly slid onto the shore on its air cushion. The video of the incident, taken by one of the beach-goers, was posted online on Tuesday. 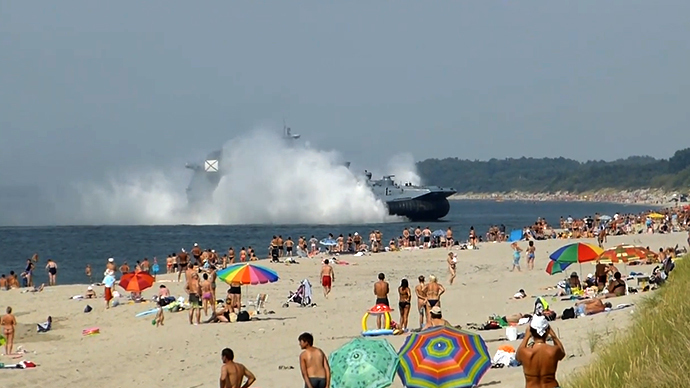 It features the amphibious landing craft “Zubr” (“Bison”), sailing on its air cushion, raising huge waves and a making loud noise as it approached a crowded beach in Mechnikovo, Kaliningrad region and eventually slid onto the shore packed with people. No one was hurt in the incident, following which marines descended from the vessel and cordoned it off. Russia’s Ministry of Defense explained the ship was out for a regular drill and said the beach actually belonged to the military. “Docking at the beach is a regular practice, what we don’t know is what people were doing at the beach, which is within the military firing range,” an official at the Ministry of Defense said. as cited by Komsomolskaya Pravda daily. The Ministry also says the ship was cordoned off to guarantee the security of the holiday-makers. “After the drill was over, the cordon was removed and the ship sailed back to its base,” said Andrey Bespaly, of the PR department for the Baltic Fleet Western military district.